After the success of the network’s first conference in Istanbul 2009 summer, the Hungarian and Uyghur PEN centers has been successfully hold network’s first academic conference, in Tállya, Hungary, in 26-30th May 2010. Second conference was in Bishkek – Kirgizstan in 22-26 July 2010 co-hosts by Japan, Uyghur and Kirgiz PEN. 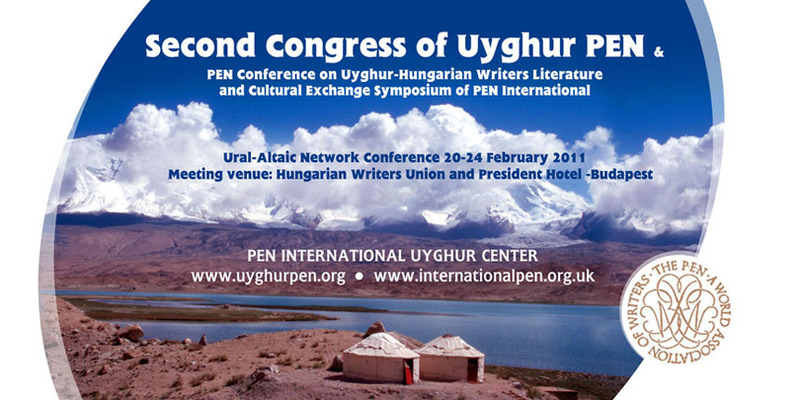 This time Uyghur PEN calling it second Congress from February 20-24, 2011 in Budapest - Hungary. Congress schedule include report from 2011 and future plan –project of Uyghur PEN. With this opportunity Uyghur PEN, Hungarian PEN and Hungarian writers union call literal and Cultural exchange conference. These events are first time in the history of this two cousin’s after long 1500 years of separation. The PEN Conference on Uyghur-Hungarian Writers literature and cultural exchange symposium of PEN International Ural-Altai Network Conference (21st February Afternoon) will be a half a day, combined cultural and literary gathering. The conference will bring together writers, poets, Journalist and linguists of Uyghur and Hungarian people — languages family of “Ural-Altaic” language. On the literary side, the conference will include presentations of papers on literature and freedom of expression, we will invite poets from these countries to read their original work. For the cultural context of the conference, on 21st February 7:00 PM - The London Uyghur Ensemble give performance of Uyghur folk music & song. A publication will follow after, with collection of Uyghur and Hungarian languages. Papers may be submitted in Uyghur and Hungarian languages, but will be translated for the publication. Please forward the call for papers to specialists in the field in your country. Poet recommendations should be received by February 11, 2011. Literary papers (or one page summaries) should be submitted by February 15, 2011.